The Drum’s digital editor Ronan Shields reflects on some of the key talking points of The Drum’s Programmatic Punch, NYC, conference hosted earlier this week with input from fellow attendee staff writer Bennett Bennett. ‘Transparency has to cut both ways.’ That was one of my key takeaways from our event this week where participants mulled the issues of the day – both old and new. The term ’transparency’ was a recurring utterance, and while it is a welcome development, it would appear that it’s not being dealt in equal measure. Before we go any further, a heartfelt thank you from all at The Drum to those who helped organize, attend and participate on stage at the event. Your generosity, attention, and input are much appreciated. And now back to the talking points. Speaking yesterday at our event, panel participant Alex Sutton III, Avis Budget Group’s director of digital acquisition, commented how he shies away from vendors that promise a “value-add.” Simply put, without transparency – which shouldn’t be confused for “disclosure” – brands just cannot be sure that ad spend with such players will “move the needle”, ie generate an ROI, he added. True, I have heard tales of how in years gone by ad impressions were purchased – via way of a phone call – and subsequently sold with a 50% markup, but with the likes of Procter & Gamble slashing at what they deem digital wastage, the glory days of trading ad impressions over an expensed lavish lunch would appear to be numbered. However, while the golden age of impression arbitrage may be consigned to the status of ‘remember when …’, the sector is still far from being squeaky clean – away from the conference floor, this was played out in the latest chapter in Facebook’s ongoing privacy crisis. The topic of the cleanliness of the adtech supply chain was put under the microscope on a separate panel where the impact of fraud was debated by a team of experts. “Fraud is not 5%, it’s more like 50%, when you look at the amount of non-human traffic on the web, you’d be looking at almost 60% [of total traffic], the fact that we’re pretending [it’s not that big of a problem] is just bizarre,” testified Shailin Dhar, director of research of Method Media Intelligence. 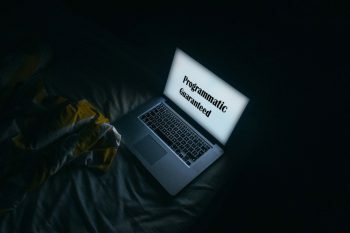 This prompted fellow panelist Jamie O’Donnell, Tag, senior director, to detail some of his trade body’s efforts to further sanitize the adtech sector with a “fight against fraud program” that will soon see it apply more pressure to the buy-side of the sector. “It’s similar to ads.txt, but really on the buy-side, and what it requires is that each entity [ie adtech company] within a programmatic transaction will have an identifier, and these identifiers will have a P-chain – kind if similar to blockchain – and what it does is give the buy-side the ability to look down a previous transaction. Speaking separately on stage Parsec chief executive, Marc Guldimann added that blockchain was poised to marginalize many adtech intermediaries, especially those unwilling to adapt to the new paradigm it will usher in. Although, he did warn audiences that most of the blockchain messages currently on the market are misnomers. A topic we researched some time back here. “The best hope for blockchain in the adtech space, is for it to align the incentives in the industry,” Guldimann told attendees. Also on stage was myself, alongside Erica Schmidt, Cadreon, chief executive officer (see video below of an interview conducted with her on the sidelines by Beet.tv) in the opening part of a dual session which could be dubbed ‘walled gardens and how to deal with them’ exploring the perspective of both the buy- and, sell-side of the industry. Schmidt explained how the IPG Mediabrands unit went about building its identifier Unity – via way of its partnership with Acxiom – as a means of helping advertisers buy media on walled gardens on a comparable basis. However, it was on the accompanying session – which explored the concept of a ‘private garden’ – a term coined by Smart’s chief marketer Michael Nevins – whereby a publisher can reduce their reliance on walled gardens in a way that lets them leverage their first-party data without handing it over to a Facebook or Google. Fellow participant Jana Meron, Insider Inc’s SVP of programmatic and data strategy, articulated the dichotomy that defines the landscape at present, particularly with regards to the expectations of advertisers and their demands of the sell-side of the industry. She told us how there is a very large advertiser in the business who is asking for all kinds of transparency through its adtech partner, but apparently it is unwilling to share that information back the other way. Speaking on the same panel, Chip Schenk, VP data & programmatic solutions, likewise said that any platform that doesn’t pass data back to his outfit is not a partner. A true partnership involves two-way traffic, and trust. By way of contrast, on a separate panel, Megan Latham, Bloomberg’s global head of advertising operations, depicted a contrasting scenario whereby the business publisher creates data segments with a mix of third-party data, and a combination of its own plus audience insights to help advertisers achieve their aims. GDPR as an opportunity, not a killer? Of course, all of this talk of data-led, audience-targeting and insight-driven media practice takes place as the industry primes itself for the upcoming General Data Protection Regulations (GDPR). Doubtless to say, this legislation will impede the ability of the adtech supply chain to gather and activate audience data on the 500 million-plus consumers living in the European Union (EU). There is now less than 60 days until GDPR comes into law across the 28 EU member states, and the casualties are mounting, with some publishers discussing the concept of switching off the programmatic pipes until they work out what the actual hell is going on. However, not all view GDPR with such an apocalyptic vent. Sara Badler, Dotdash, head of programmatic revenue and strategy, told attendees that GDPR will ensure that ad dollars are put to work with engaged audiences and and spoke of her confidence that it will definitely be a wind in the sales of those producing quality content. The event was also attended by my fellow member of the editorial team, Bennett Bennett. As a reporter that covers the media beat, he sat in on a panel focusing on the merging worlds of adtech and television where Tal Chalozin, chief technology officer, Innovid, discussed this sector with Brett Hurwitz, Oath, business lead, advanced TV. Chalozin recounted how in 2017, only 7% of ads [that Innovid] delivered on a monthly basis were viewed on television, while the rest could be broken down between desktop and mobile devices. However, Innovid has seen a huge jump in television viewing nearly three months into the year. “We started 2018 with 24% of delivered ads being viewed on television and it could top out at around 30%,” said Chalozin. Bennett added that his most interesting takeaway from that panel was that television is increasing its share of voice, especially through OTT and connected TV — and even pulling away viewership from mobile. “We’re going to get to a point … where we’ll see more viewership of ad-supported content on television screens via Roku and other devices than on desktops,” added Chalozin. Are consumers full of forgiveness when it comes to brand safety? Elsewhere, panelist Caitlin McGovern, head of programmatic, at Twitter-owned supply-side platform MoPub, said it could be argued that there are elements of the advertising industry that are over-sensitive to the issue of brand safety. Participating on the same panel, David Kohl, president and chief executive of premium supply-side platform TrustX, acknowledged that reactions among some players in the ad industry can veer towards overreaction when it comes to lapses in brand safety technology. Ultimately, consumers are more forgiving around brand safety than many people credit them with, according to the pair. However, McGovern did hasten to add that intermediaries have to provide advertisers with insight when it comes to handling their ad dollars, particularly when it comes to providing clarity around tone of voice. McGovern was referencing the ever-present issue of ‘unfortunate’ brand placements within what is otherwise a safe brand environment, such as an airline ad being served next to a news story about a plane crash via adtech. Having a relationship with a publisher on an SDK-level, really makes clear to the marketer that their ad spend is yielding results, she added. Lastly, I’d like to say that the above comments are my own edited highlights of the full array of discussion that took place at Programmatic Punch, NYC simply put, there was just too much insight shared to cover exhaustively. Sign up here for details of the next installment. Of course, Programmatic Punch would not be possible without the support of our sponsors: Grapeshot; MoPub; ParSec; Smart and Sharethrough. More content from the day’s proceedings will follow.